I finished up a pair of socks. 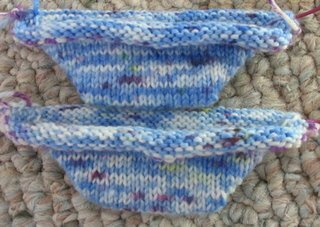 I did finish the knitting on the 31st in time for Socktober, but I didn't kitchener the toe of the second one until the next morning. I forgot the details, the yarn is Cascade Fixation, with my usual basic top down sock pattern. I'm please with the fit, we'll see how well they hold up to wear. And since despite all the other projects in progress I always like to have a sock going. I cast on a couple of toes last night. 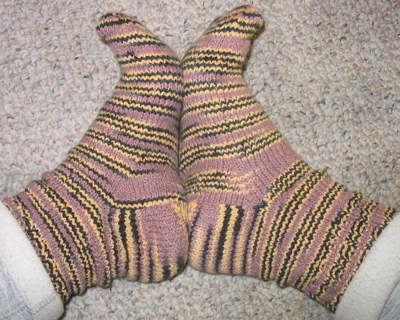 I'm combining Wendy's Toe Up socks with the Jaywalker pattern from Grumperina. I'd promised myself that the Jaywalkers were next, but I was really in the mood for toe ups. We'll see how that goes. I'm using 2mm needles! 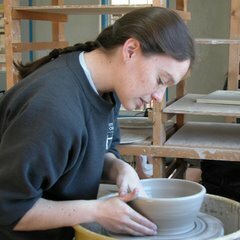 Kind of like working with toothpicks, but I seem to get getting the gauge I want. This is also my first real project with my own dyed yarn. And finally just to make things more interesting I'm going to try to work them at the same time. I've done it before and got annoyed, but it's time to try again. Cute socks — what yarn was that? October just kind of evaporated, didn't it?! Great socks! Love the start of the new ones. Did you get some hits on your bowls? Nice socks. I really like the new ones; pretty dying job.